Singapore, February 7, 2011 — The organisers of the Sundown Marathon confirmed the routes for the 100km ultramarathon today. 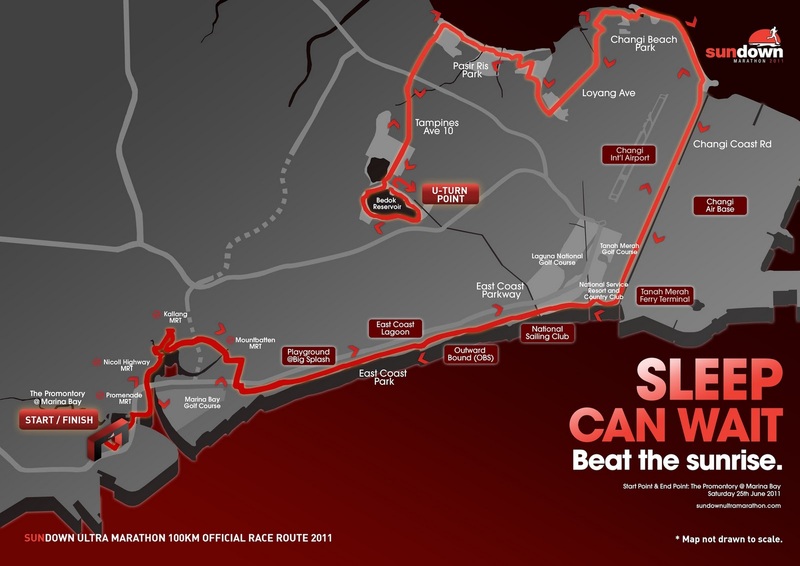 The 100km city race will take runners from the start point at Marina Bay down to Kallang before hitting East Coast Park. Runners will then make their way along Changi Coast Road before reaching Pasir Ris Park. The final leg of the race will see runners make a U-turn at Bedok Reservoir Park before heading back to Marina Bay. Since registration opened last November, more than 720 runners have already signed up for the Sundown Ultra Marathon, which is expected to attract about 1,000 participants. All runners of this elite distance will have to carry a hydration pack and complete the distance within the 16-hour cut-off mark. There will be hydration top-up stations every 10km and food supply stations after the 40km mark. The fourth edition of the Sundown Marathon will take place over two days for the first time. The 42km marathon will be run on May 28, 2011, about one month before the Sundown Ultra Marathon. Participants of the 42km marathon will race along the eastern area of Singapore and will be flagged off at Changi Exhibition Centre. A new 10km category for men will be introduced for the first time at the event as well while running equipment brand New Balance has also signed on as the apparel sponsor for the race this year. A total of 25,000 participants have signed up for all the categories so far, beating last year’s total of 19,500. “With the new city route and 100km race category, we aim to give runners a unique running experience as they celebrate their passion for running during Singapore’s biggest night race,” he added. Yeah! 100km ultra marathoners will start at Marina Bay !